In the quest for safer cycling, the village of Oak Park just outside Chicago has gone punitive. This leafy suburb recently enacted a mandatory helmet law for children under 17. Parents of tykes riding trikes and Huffys could face fines and community service if their children are caught without a styrofoam cap. Few sensible people would dispute the benefits of encouraging children to ride their bikes. 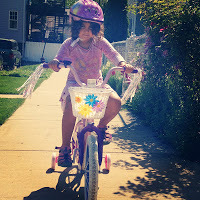 Bikes promote independence and good health for kids (and adults). They also happen to be really fun. Injuries sometimes occur, so kids should be taught safe riding practices and should be encouraged to wear a helmet. When kids wear bike helmets the chance of injury is very significantly reduced. According to Children’s Hospital of Illinois, “Wearing a proper fitting helmet can reduce the chances of serious head injuries by 85%.” It is hard to argue with statistics like that. Yeah, children should be encouraged to bike with a helmet, but first they should be encouraged to just ride. Parents need some leeway with regard to how to accomplish that. The new Oak Park ordinance is fairly harsh. “Parents of children under 17 will be required to pay a $25 fine or perform up to four hours of community service if their child is caught three times riding a bicycle without a helmet,” according to The Chicago Tribune. Many parents will feel it necessary to force their children to wear a helmet in the face of this potential punishment. Some may even receive the misleading message that if the law requires helmet use perhaps biking is just too dangerous an activity for their kids. In my opinion, helmet use for kids and adults alike should be encouraged, not mandated. Elsewhere on the Network today: Cap’n Transit says many of New Jersey’s cities are very bike and transit friendly, but traveling between them is a whole other story. Systemic Failure wonders what American rail planners have against articulated train sets. And Peninsula Transportation Alternatives reports the city of East Palo Alto is beginning a transportation demand management program to help workers find ways to commute without driving. Is There Such a Thing as Too Much Emphasis on Safety?